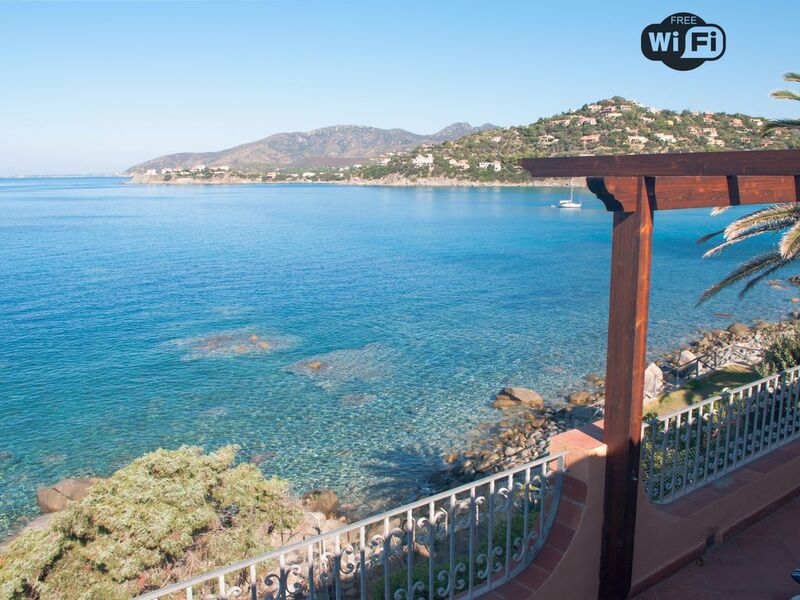 Villa AngelaD is situated in the locality of Torre delle Stelle and offers a beautiful view, free from any obstacle visual , a 180 ° on the Gulf of Cagliari. Thanks to its privileged location, few meters from the shore, during the stay, it is possible to feel the the sound and the perfume of the sea. Villa AngelaD occupies all the entire top floor of a "bifamiliare structure" which extends in height. This kind of structure guarantees to all guests a greater privacy because Villa AngelaD is designed to be independent and there are only some common places with the guests of the lower floor of the house such: the parking (one parking is for you), external stairs, the entrance gate. "Villa AngelaD" has three bedrooms (two doubles and one with bunk beds), two bathrooms, living room, kitchen, veranda, laundry area, garden and free parking. In Villa AngelaD there is unlimited wifi internet. - Internal bathroom to the double bedroom (shower box, bathroom sink with mirror, bidet, WC, window with mosquito net, stool, basket, carpet for the bathroom "antislip", hair dryer). - Modem for Internet "Unlimited" (speeds up to 7 megs) - free. - 2 Fridge Bags (ideal for the sea) and icicles for the Fridge Bag. - 6 folding chairs (internal use and external). - Garden with plants and flowers (not suitable for play). In “Villa AngelaD” there is a common parking with the guests of the lower floor of the house (1 parking is for you). There are other parking available near “Villa AngelaD”, in the street. In Villa AngelaD there are 2 bathrooms: In "Villa AngelaD" there are two bathrooms: - Bathroom “central” (shower box, bathroom sink with mirror, bidet, WC, window with mosquito net, stool, basket, carpet for the bathroom "antislip", hair dryer); - Bathroom "internal" to the double bedroom (shower box, bathroom sink with mirror, bidet, WC, window with mosquito net, stool, basket, carpet for the bathroom "antislip", hair dryer). In the garden of Villa AngelaD is present an outdoor shower with hot water. Garden with plants and flowers (not suitable for play). ENGLISH - HOUSE RULES: 1)The guest will make the separate waste collection according to the rules explained at check-in; 2) For safety, please close all doors (with the key) and windows when you leave the house; 3) Please turn off lights, air conditioning, electric oven, microwave oven and do not leave the water taps open before leaving the house. 4)Please turn off the fire in the Barbecue before leaving the house. Please never leave unattended flames (fire hazard); 5) Please do not smoke inside of the Villa and the animals are not allowed in Villa AngelaD. Please, not to allow animals to enter inside the house; 6)"In the final cleanning" of Villa it is not included: washing plates / cutlery / pans / trays / cups, oven, cooking / barbecue floor. Otherwise, the cost of this cleaning will be deducted from the deposit; 7) Check-in and check-out to define (usually, check-in H. 4 pm - check-out: h. 9:00 am). The house is absolutely recommendable and the owners are so nice and hospitable. It was great to have so many helpful equipment in the kitchen. I have never been to a holiday home before that had so many kitchen stuff, plates, pots, pans etc. That was really perfect. Also the rooms were very nice and the garden was beautiful too. My highlight was the breathtaking view from the terrace over the sea. Watching the sunset with a glass of wine...great holiday. Thanks for that!! Very well equipped , beautifully furnished and very clean house. The images correspond to absolute reality. We had plenty of towels and beach towels. For the first boarding the landlord had already taken care of and surprised us with Sardinian specialties. The place is late March, early April still very quiet and the supermarket was open only on weekends, the restaurant still closed, but that did not bother us because of the great location. The beach is just a few minutes. The owners are very nice and reliable. Wir waren vom 8.9 -22.9 2018 in der Villa Angela'D. Das Haus ist wirklich sehr gut ausgestattet, es fehlt in der Küche und auch sonst an nichts, selbst Sonnenschirme und Tauchermasken sind vorhanden. Wir wurden, obwohl es schon 21:00 Uhr war, von den Besitzern sehr freundlich empfangen. Das Haus liegt sehr schön direkt oberhalb des Strands, 2 Treppen runter und man ist im Meer. Schöne Terasse mit Ausblick nach Westen, tolle Sonnenuntergänge sind vorprogrammiert. Die Strassen im Feriendorf sind allerdings gewöhnungsbedürftig, vieles ist unbefestigt und viele Schlaglöcher. Alles bestens - tolle Lage, sehr nette Vermieter. Der Blick ist absolut traumhaft schön! Das Appartement ist sehr gut ausgestattet. In der Küche sind alle notwendigen Dinge vorhanden. Die Lage erfordert ein Auto. Absolute Ruhe, daher wunderbar erholsam. Die Appartementgröße ist offensichtlich mit der sehr schönen und großen Terrassen gerechnet worden. Im Ort fast ausschließlich italienische Touristen bzw. Besitzer von Ferienhäusern, was wir toll fanden. Kein Massentourismus. Insgesamt ein gelungener Urlaub mit Weiterempfehlung, was primär am Traumblick und dem glasklaren Wasser auf Sardinien lag. Sehr sehr nette Vermieter!!!! Super schönes Ferienhaus in ruhiger Lage. Das Ferienhaus hat eine sehr schöne Aussicht und ist gut Ausgestattet. Die Vermieter sind sehr freundlich und hilfsbereit. Wir hatten eine schöne Woche, auch wenn das Wetter nicht immer mitgespielt hat. Torre delle Stelle has a distinctive aroma offered by eucalyptus in bloom. We recommend renting a car with navigation to facilitate travel and to visit without problems all the beautiful coastline. In Torre delle Stelle the roads are not paved. "Villa AngelaD" is on the coast, near the beach “Cannesisa”, in Torre delle Stelle. No other house in front at the veranda "Villa AngelaD", to benefit totally of a view 180°. - 5/8 minutes from the rocks (the time depends on the experience of walking in the rocks). The beach has a beautiful fine white sand and clear sea. "Villa AngelaD" is an ideal lodging for those seeking tranquility and relaxation, in contact with the sea and nature.